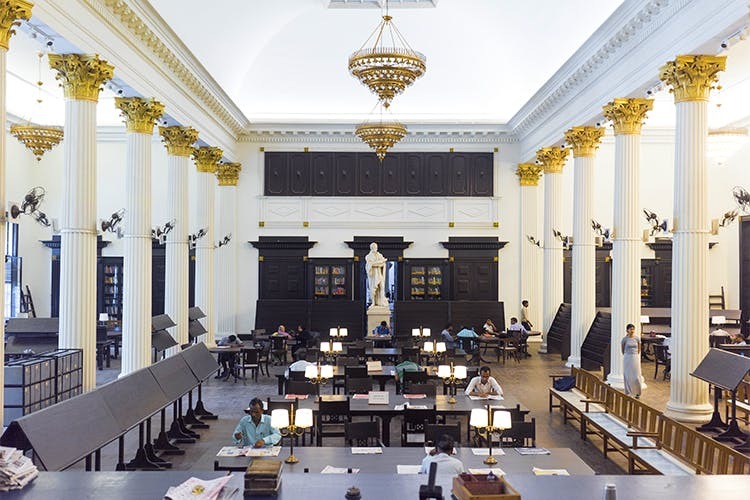 The central hall of the Asiatic Society Library has undergone restoration and is finally open to the public after being shut off for almost a year. It’s grand, beautiful and breath taking, and we got a sneak peak into its restored hall. The Asiatic Society of Mumbai aka Town Hall was built back in 1833 by Colonel Thomas Cowper. This makes the building almost 184 years old, closing in on two centuries. Standing tall with its white columns and majestic high-ceilings, The Town Hall has finally gone under restoration to repair the damages done over time. The central hall is open to the public now. Laxmi Hericon is the company that has undertaken the restoration project. Shrinivas G Saluje, the managing director of the firm tells us the work at The Town hall began eight years ago in 2009; in phases with just one more phase to go. Currently, there’s one more phase to go – to repair the outside facades and the steps that have been blocked from the public. Keeping the original designs and materials as close to the original as possible, the central hall looks ravishing and straight out of a classic novel. With its high-rising chandeliers, the steel cupboards that have given way to hand-carved wooden bookcases and reading stands, the hall looks as good as new. Even the little-little intricate details have been taken care, reiterates Saluje. For example, the lions mouth found on the cupboards and columns, has been replicated to the T – keeping its authenticity intact. The ionic columns have been repainted and plastered freshly to give off a smooth look, along with the statues that have been coated with protective paint and restored. The central hall is open to the public again, and may we reiterate it is beautiful and breathtaking.